In Bengali households, winter is celebrated with specially made Bengali delicacies called Pithe Puli. There are various versions and types of Pithe prepared in both West Bengal and also in Bangladesh. Mostly prepared during Makar Sankranti (Paus Parbon) these Pithe Puli are true traditional Bengali delicacies. There are both Sweet and savory versions of Pithe Puli. Till date in our Kolkata residence, Maa and my aunties prepare more than twenty types of Pitha during winters which include Patishapta, Dudh Puli, Bhaja Pithe, Gokul Pithe, Rosh Bora, Nolen Gurer Payesh and many more! In my in law’s place apart from Sweet Pitha, my MIL prepares Savoury Pithe as well. This year I thought to prepare Pithe for the first time and Mom suggested me to start with the easiest type which is Patishapta! Fortunately, my first attempt at making Patishapta was successful! Patisapta is a delicious Bengali Pancake stuffed with Jaggery flavored Coconut. It is a Signature Bengali Sweet. My Dida (Mom’s mother) used to make Patishapta during winters! However, Dida’s Patisapta was prepared with only All Purpose Flour and Semolina but I prefer to add Rice Flour to my Patishapta. I have used Patali Gur or Date Palm Jaggery in my Patishapta. If you are not available with Patali Gur then it can be substituted with normal sugar though date palm Jaggery gives the best taste to Pithe. Talking about Dida’s Patishapta; there were several variations. I have had Narkeler Pur Patishapta (stuffed with coconut); Kheerer Patishapta Pithe (stuffed with Kheer/ evaporated milk); Sondesh-er Patishapta (stuffed with Sondesh). Then there wash Sukno Patishapta (dry Patishapta without stuffing). My MIL, on the other hand, makes Mangsher Patishapta (stuffed with meat); Moong Daaler Patishapta (prepared with yellow lentil and stuffed with coconut) and also Koraishutir Patishapta (stuffed with Green Peas). 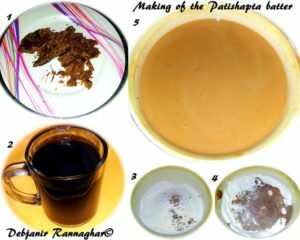 Here’s how I make Patishapta at Debjanir Rannaghar! Patishapta or Patishapta Pitha is a famous Bengali Pancake or Crêpe type sweet prepared mostly during the Winter. Take around 1.5 Cup water along with Patali Gur/ Date Palm Jaggery in a pan. Cook on medium flame to dissolve the Jaggery completely. Switch the flame off and strain the Jaggery water and keep it aside. You can replace Patali Gur/ Date Palm Jaggery with Sugar. Sieve Rice Flour, All Purpose Flour and mix Semolina with both the Flour in a deep bottom Bowl. Now start adding previously prepared Jaggery water to the Flour mixture for preparing a lump-free, thick paste. If required, you can add little milk to the mixture. It took me approximately 1.5 Cup of Jaggery water and ½ Cup Milk to prepare the batter. Cover the batter and give it a stand of 30 minutes. Make small pieces of Jaggery and Khoya and keep those aside. Take freshly grated Coconut in a Frying pan (preferably non-stick) and cook on medium flame for around 5 minutes or till the water content of grated coconut reduced. Now add chunks of Jaggery and cook for around 5 minutes or till entire Jaggery dissolves completely. The same rule applies here also; you can replace Jaggery with Sugar. Add Khoya to the mixture and cook in low flame till Khoya mix completely with the Coconut. Continue cooking in medium flame for around 5 minutes to get a thick mixture. You need to stir continuously at this stage. Switch the flame off and transfer the filling to a plate and allow it to cool. Now it’s time to prepare the Crêpes. Take a spoon and give the batter a stir. Now take a Non-stick Pan/ Tawa and heat it properly and grease the Pan with little Ghee. Take one ladle full of Batter and pour it in the center of the pan and using the backside of the ladle spread the batter to prepare a Circular disk. Cover the pan with a lid and cook on low flame for around 30-40 seconds or till the Crêpe turns golden brown in color. We don’t need to cook the Crêpe from another side. Now place 2 Tbsp. of the filling at one side of the Crêpe lengthwise and start folding the Crêpe from the same side to roll it completely (as shown in the picture). 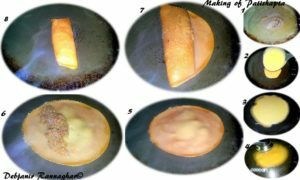 Remove the Roll/ Patishapta from the Pan and following the same process prepare rest of the Patishapta. Patali Gur is available all through the winter in West Bengal and in Bengali specialty stores outside Bengal or the country. 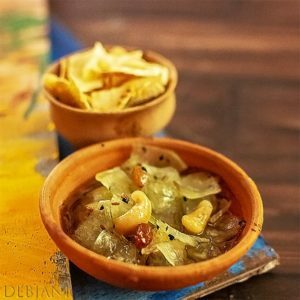 Have you tried the Patishapta Pitha recipe from Debjanir Rannaghar! 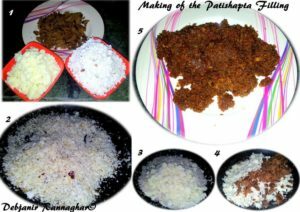 The Patishapta recipe was featured on Rediff on World Pancake Day!